A Constructor. 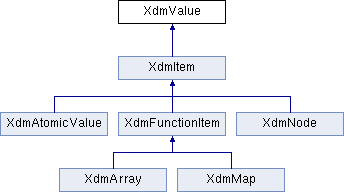 Wrap an Java XdmValue object. val - Xdmvalue Add an XdmItem to the sequence. This method is designed for the primitive types. Reimplemented in XdmNode, XdmItem, and XdmAtomicValue. Reimplemented in XdmNode, and XdmItem. Get the n'th item in the value, counting from zero. the n'th item in the sequence making up the value, counting from zero return NULL if n is less than zero or greater than or equal to the number of items in the value return NULL if the value is lazily evaluated and the delayed evaluation fails with a dynamic error.